During a journey last year to the Venetian fortress of Spinalonga, we passed through the town of Ayios Nikolaos (called “AgNik” by foreign residents), but didn’t visit. Since it is just off the E75 highway and has an archaeological collection, we decide to take a day trip on the KTEL (public) bus. 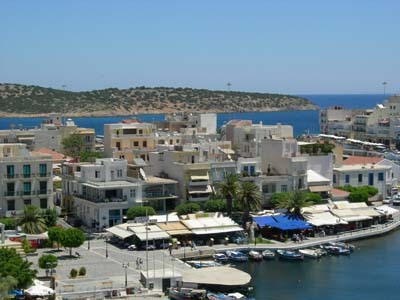 After a light breakfast, we hike from our quiet apartment in Koutouloufari village down to the hectic, pedestrian-unfriendly main street of Limin Hersoni­sou (Port of Hersonisos). We wait only a few minutes at the stasi before the next eastbound bus arrives. Fortunately, the driver has decided to turn on the air-conditioning (not all of them do), so the interior is very comfortable. The bus takes the coast road through Stali­dha and Malia, where swimmers and sunbathers are already swarming onto long sandy beaches. Several kilometers farther and only olive covered hills crowd near the sea. As the bus passes into the Prefecture of Lasithi, we enter the rocky Selinari Gorge with its monastery of Ayios Georgios built upon the rocky cliffs. The roadside is littered with cars of tourists visiting the monastery, which at one time was practically inaccessible to the outside world. It is amazing what changes a road can bring! 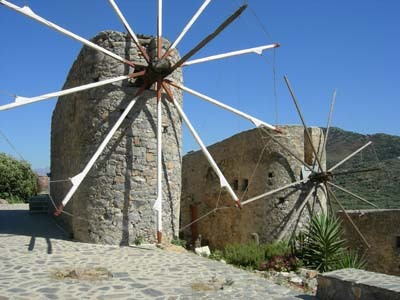 On stony ridges above the road are rows of old-style windmills, relics from the days when grains from the fertile Lasithi plateau were locally milled. 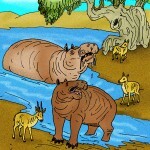 We also see several near the highway outside Neapoli, former capital of the prefecture. When improved roads brought the produce of Lasi­thi to processing plants in Iraklio, these local windmills ground to a stop and support towns like Neapoli became less important. 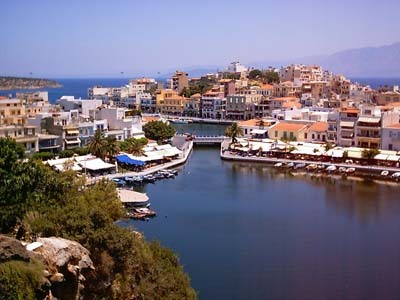 Dropping down from the highland pass, we come to the modern town of Ayios Nikolaos, the current capital of Lasa­thi. 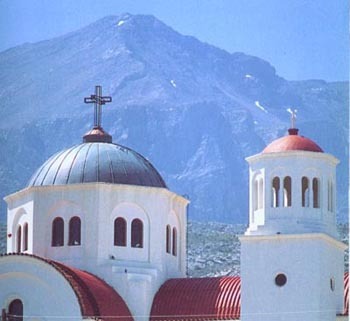 It is built on the site of the ancient port of Lato, an important seaport during the Roman and Byzantine periods. 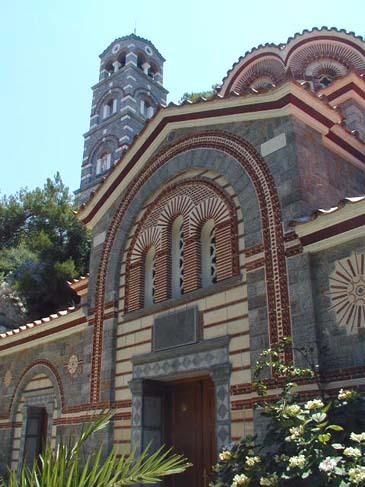 Renamed Ayios Nikolaos, after a small Byzantine church of located on the peninsula, the town continued to flourish for hundreds of years. When the Venetians took control of Crete, they built the fortress Mirabello (meaning “beautiful view”) on the site where the Prefecture administration building stands today. Nothing remains of that fortress except its name, which transferred to the gulf – Mirabello. When the Venetians built another port and fortress (Spinalonga) near Elounda in the northwest, the value of the harbor at Ayios Nikolaos declined. 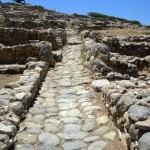 In modern times, Ayios Nikolaos was an inconsequential village until the Greek government built a major road from one end of the island to the other. Then the town quickly regained prominence. It is now a government center and developed tourist town, largely because of its accessibility. Upon arrival at the main bus station, we locate the nearest street signs and check a city map to get our bearings. Our first objective turns out to be uphill all the way from the bus station. The archaeological museum is a deteriorating structure that has seen better days (we learn it is scheduled to be replaced with a new museum). Happily, it is much more impressive inside. The government often removes really good stuff to larger museums. 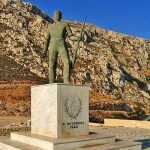 In fact, some of the greatest antiquities from Lasithi are on display in Iraklio and Athens. However, the museum of Ayios Nikolaos boasts an excellent collection of artifacts from the early Stone Age through Minoan, Mycenaean, Roman and Byzantine periods. 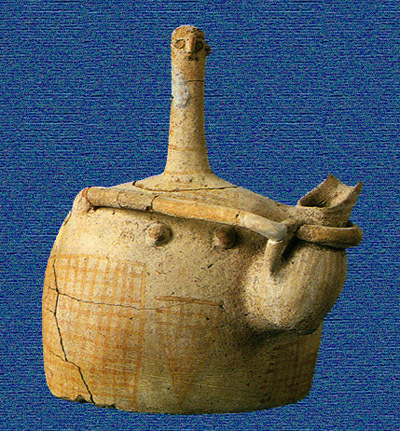 The most celebrated treasure is the “Goddess of My­rtos,” a long-necked figurine – actually a jug – of the early Minoan period (2500 BCE). It was probably used in religious ceremonies during the Bronze Age. 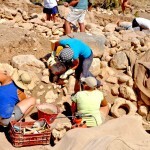 Archaeologists found the jug in an excavation near Myrtos village, on the south coast of the Lasi­thi prefecture. Although the My­rtos figurine is extremely rare, it reminds me of figurines produced at about the same time in the Cycladic islands, north of Crete. 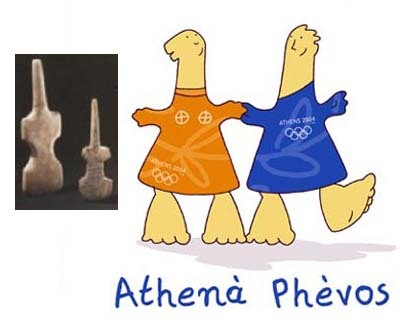 Such figurines inspired the design of mascots for the 2004 Olympic Games in Greece. 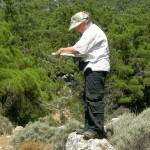 It makes me wonder about contacts between ancient Minoan and Cycladic peoples. 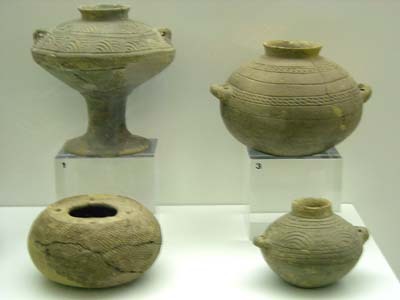 The museum also has an impressive collection of pottery with excellent examples from different styles, showing the evolution of ceramics over the centuries. 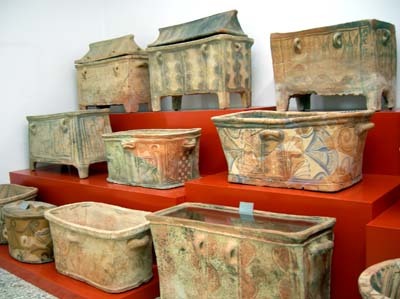 To us, the most interesting exhibit is a collection of Late Minoan clay sarcophagi, or larnakes, with painted birds, fish and various other designs. Archaeologists once thought that all larnakes were burial chests, until they discovered some with drain holes and plugs – apparently bath tubs. You have to look closely to distinguish one type from the other. There was one clear example of a sarcophagus, with the occupant still inside. After leaving the museum, we walk towards the harbor – fortunately all downhill. The first landmark we encounter is the small lake known as “Voulismeni” located at the foot of cliffs near the harbor. According to mythology, the goddess Athena used to bathe in this lake (though it seems a long way from her home on Mt. Olympus). The unusual lake, allegedly more than 60 meters deep, is only a few meters from the sea. A short canal was built in 1870 to connect the lake with the harbor. It is a picturesque site with many open-air cafes and restaurants along the bank. We walk around the lake to the harbor, lined with tour boats and surrounded by cafes. There is a pleasant sea breeze to cool the air, so we find a comfortable place to sip coffee frappes before exploring more of the town. Your website provides a lot of helpful information. I enjoyed reading it.